Gabby loved the rubber Kong toys ever since she was little. When I saw the Kong Wobblers, I picked one up for her to try. She loved it, and it made its was on the list of toys she approved of. I called them “Big Kongs” when we played with them. I would put little treats in them and she would get really excited as I shook the toy like a rattle. She was very adept at getting the Kong in position and rolling it so the treats fell out, as you can see in the video above. 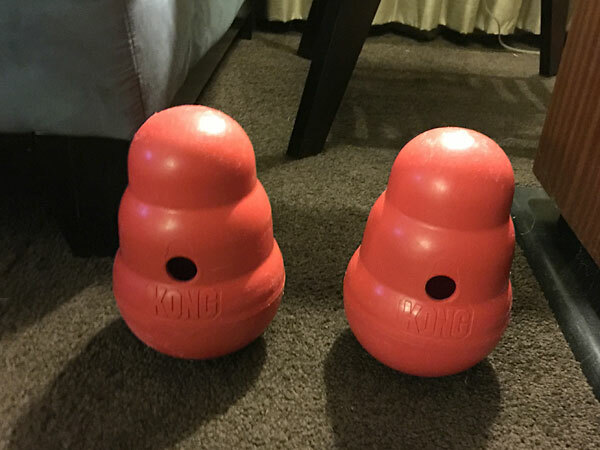 She was able to bounce the small and middle sized Big Kongs so well that I got her the biggest one, which was sized for German Shepherds and Great Danes. You can see her playing with one in the video above. It was a great way to provide her with exercise as she got older. She would push it around for hours… across the floor, behind the sofa, down the hall and back. I think it helped keep her strong and flexible, and I highly recommend them. When I needed to keep her interested in the toy for longer periods of time for exercise purposes, I would put in treats that were too big too fall out, or get an Arby’s Roast Beef sandwich, soak it in water and make a paste, and rub it in the bottom of the Kong so an irresistible smell would come from it. That always kept her interested! Of course, when Beni came into our lives he got some big Kongs too! I probably have five or six of them in different sizes. Darlene even found one under her sofa as I was creating this website.